This coming April 23rd will mark the first anniversary of the U.S. Senate's 56-43 vote to confirm Loretta Lynch as Attorney General. 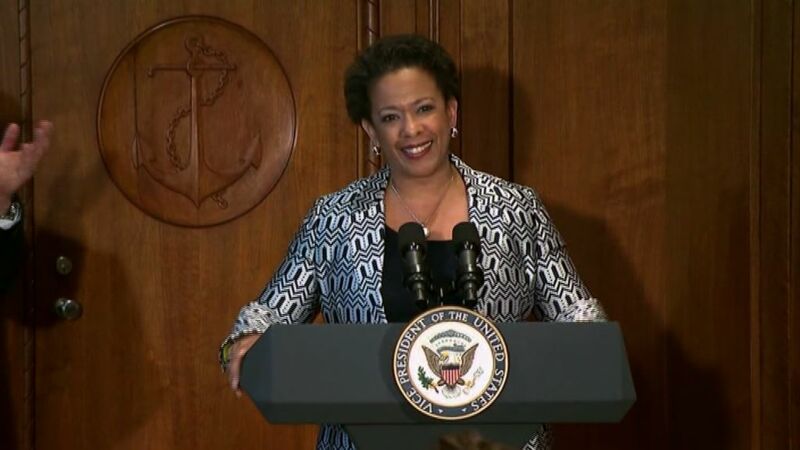 By so doing, Lynch, a former U.S. Attorney for the Eastern District of New York, followed Eric Holder's historic tenure as the first black man to hold the position by becoming the first black woman to serve as America's top law enforcement official. But with reports from Washington last week indicating that the FBI will soon interview former Secretary of State Hillary Clinton and several of her former aides regarding the seemingly never-ending classified email scandal, Lynch could make history yet again if she decides to indict the Democratic presidential front-runner. Some who are reading this post may be thinking "not this e-mail mess again." But until the matter is resolved one way or another, the investigation, and Lynch's looming decision, hover like a shadow over this year's race. Since the email scandal first emerged last year, Clinton's chief rival, Senator Bernie Sanders, repeatedly has declined to use the federal probe as campaign cudgel. Because of that, most of the criticism has emanated from the Republican presidential field and the right-wing media that devote ink and airtime to speculation that Clinton's indictment and conviction are all but inevitable. For this reason, many Democrats, including some Sanders supporters, have dismissed the scandal as yet another Republican attempt to sully Clinton's reputation. Still, the fact that dozens of FBI agents have investigated this case during a Democratic administration is proof that this is no Republican sponsored witch-hunt. Further, federal investigations often are as slow as molasses and can take months, if not years, before cases are submitted to prosecutors who will decide whether to seek indictments. Attorney General Lynch has wide discretion in determining whether to prosecute. Rudy Giuliani, a former mayor of New York City who also served as a U.S Attorney, earlier this year suggested that having worked with Lynch before, that if probable cause existed to suggest that a crime was committed, that Lynch would prosecute. In a time as polarizing as ours, the fact that a conservative Republican like Giuliani would even make mention of his belief in Lynch's prosecutorial ethics can be considered either a high compliment—or a subtle attempt to persuade Lynch to indict to appear fair and impartial. The question, however, is whether Lynch, by serving in a Democratic administration, can render a decision devoid of politics? Conventional wisdom would suggest "no," that the stakes are too high for Democrats when considering that a President Donald Trump or Ted Cruz would have an opportunity to nominate as many as three Supreme Court justices within the next few years. Further, with Lynch also in line to continue serving as the nation's top prosecutor in a Clinton administration, reasonable minds could ask whether her personal ambitions could play a role in her ultimate decision? A few months ago, former Secretary of State Colin Powell, a moderate Republican who served under George W. Bush, indicated that he, too, had used private email for classified information during his term in office. Because of that, many Americans, like Powell, simply do not see why this is being made into a huge deal since to date, there are no indications that any information that was critical to America's security was shared by Clinton. The truth of the matter remains that Clinton, by signing a Non-Disclosure Agreement pursuant to President Obama's executive order regarding classified information, understood that mishandling classified information could lead to criminal prosecution. SEE MORE: Will an Emboldened GOP Turn on Obama's Attorney General Pick Loretta Lynch? From a purely legal standpoint President Obama's executive order, with its "knowing" and/or "negligent" provisions, covers the gamut from intentional acts to "oops, my bad." Still, if the evidence tends to show the latter, that Clinton, like Powell, was not being shady but simply was not paying attention to the specifics of the agreement, such could lead Lynch to punt the football and refuse to impact the presidential sweepstakes over a series of less than harmful mistakes. With Secretary Clinton still locked in a bitter primary race against Senator Sanders, should Attorney General Lynch break Democratic assumptions and prosecute prior to the Philadelphia convention in July, what impact would such a decision have on the ultimate outcome? Further, knowing that an indictment is not a conviction, could an indictment swing super-delegates currently pledged to Clinton to Sanders? Perhaps, but the reverse also could prove true if a defiant group of super-delegates decide to hold firm and support Clinton come Hell or high water while blasting what many Democrats believe to be politically motivated allegations of wrongdoing. Time, indeed, will tell. But in the meantime, Attorney General Lynch, the first Black woman to serve in that capacity, has a potentially game-changing decision that could either help Secretary Clinton become the first woman to serve as president—or severely cripple her prospects of breaking through that glass ceiling in 2016. Chuck Hobbs is a lawyer, social activist and freelance writer who won the Florida Bar Media Award in 2010 and was nominated for a Pulitzer Prize in commentary by the Tallahassee Democrat in 2011. Follow him on Twitter @RealChuckHobbs. Opinions expressed above belong solely to the author.